Elongated Table Models offer an enlarged surface area, providing increased visual contact. Promotes quieter interaction between students. Torsion Bars and Torsion Springs work together to provide long-lasting lift assistance. 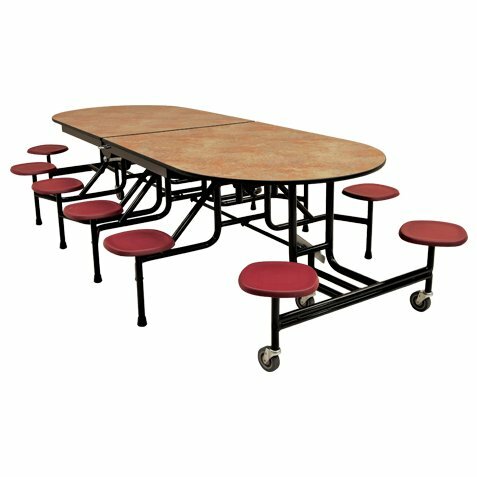 One of the easiest lifting cafeteria tables on the market. Center Latches are accessible from either side of the 59T Elongated Table. Saves time – less walking around tables. Two-stage latches have safety stop and in-use positions. Allows for easier set-up positioning and clean-up. Wheelchair-accessible Model provides access for two wheelchair users plus seating for ten.Promotes inclusiveness in the student body. Storage Latch secures table in upright position. Locks lunch table for storage or moving. End Leg Assemblies with center wheel offer superior weight distribution. Equipped with six ball bearing Poly II swivel casters. Stronger, more durable school tables.